Myths of Energy Pendant Part 5: The story behind – Demonstration | to be or not to be? The key tests performed by Fusion Excel members are strength, flexibility, balance, and lifting (levitation) (click to view the demonstration videos). Other variations are mainly based on the aforementioned four key tests, like the ones you see in Phuah Chu Kang’s endorsement. Many of us who being first skeptical about the energy pendant which we were told as scientific had a second thought when the tests were demonstrated. In fact the tests were so believable that it is difficult for us to push aside this magical wonders by labeling it as mere unscientific. In this article, we will be looking into the details of each test, and explain why the demonstration are certainly effective, scientific, but fallacy at the same time. The test is usually being conducted twice, once without pendant, and once with pendant. The strength video shows the agent Malik Nor (Yup, Mr. M the bodybuilder) when he was still with FusionExcel conducting the Strength test. Mr. M is pushing away from the invited guest (Mr. G), and Mr. G lost his balance. Mr. M is pushing down towards the gravity point of the Mr. G, and Mr. G able to remain at his position. What’s the science behind this test? Let us look at the next diagram. Assuming both input same amount of force, the combined force in the first attempt would be slightly to the left. Hence Mr. G should lost his balance in the name of Physics. 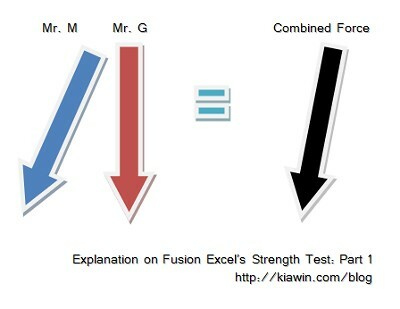 Assuming (again) Mr. M still fit and deserves his bodybuilder title, he should be able to input greater force than the uncle Mr. G, hence the combined force should be further away from Mr. G.
How about the second attempt? 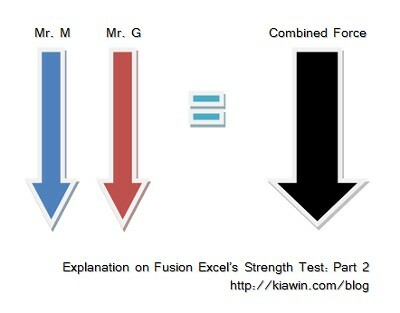 As both Mr. M and Mr. G are sending their force downwards, the combined force should provide better balance for Mr. G to remain its position. In the name of Physics, Mr. G should stand firm in his position. In one sentence, this is an application of elementary physics. It works, with or without the energy pendant. Ouch. As seen from the video, two tries were made, one with and one without the pendant. If you are adventurous enough, go through youtube and check out the flexibility test. Most likely all tests carried in this order – without pendant, with pendant. 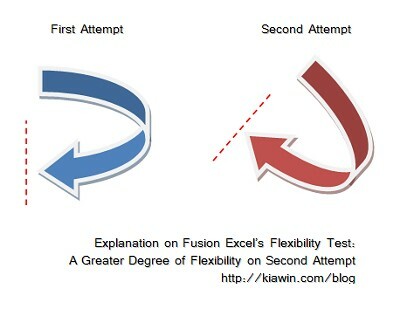 You will see that the degree of flexibility of first attempt is lesser than the consequent attempt, as depicted in the following diagram. Do you still remember the days of warming up before your physical education class, and stretching is somehow incorporated in it? Our first attempt in stretching to the right may perhaps up to a maximum of 30 degrees (to the right), while the next attempt might be 35 degrees, with an increased of 5 degrees. Why so? The closest link that comes by is what we called physiology of stretching. In one sentence, this is the art of stretching. If we reverse the order of test (with, then without), we will fail to prove the effective of the energy pendant. Double ouch. 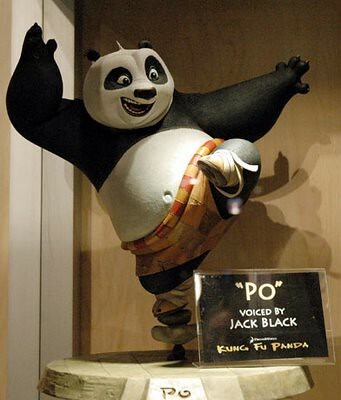 In this test, the invited guest will be given an interesting task to stand like Po, the kungfu panda. The first part of the test was about the application of force, while the second part of the test was actually about our body muscle. With all the information provided in Test 1 and Test 2. Will you be able to explain how it works, with and without the energy pendant? It’s time for you to apply what I’ve explained in the first two tests. In one sentence, it is again another application of physics and physiology. Triple ouch. The lifting test is a mere party trick which has nothing to do with energy pendant. WikiHow and many other sites provide extensive explanation on how party levitation trick works, and I’ve no plan to further elaborate here. In one sentence, it is a trick and it works, with and without the pendant. Should I ouch more? Yes, some of you might still refuse to accept the reality that all the aforementioned tests are unrelated to Fusion Excel energy pendant, and nothing to do with the magical scalar energy. Richard Saunders from Australia has done an interesting short video to show you how all these bluffs worked (yes, i use the word bluff). Yes, all tests are based on science – as it is repeatable and consistent. However, none of it has anything to do with scalar energy, biofield or Fusion Excel’s energy pendant. If you have read, and decided that energy pendant is a fraud – I’m glad to hear so. If you have read, and decided that energy pendant works as long as we believe it – wait for my next article. If you have read, and decided that I’m nitpicking on Fusion Excelt and I’m talking non-sense – just continue pay your hard earned money to buy what ever products you like, as long as not from my pocket. If you have read, and decided to challenge me in court – I welcome you to expose your own dirty business. Scammer! Shoo!